A hunting cheetah is fast, stealthy and focused, but that doesn’t mean there aren’t challenges to overcome before she and her cubs can eat. She often sustains injuries from her prey as it kicks in panic and not every hunt yields a prize. To improve her chances of success and reduce risk of injury, the cheetah has adapted a very refined approach to hunting. A cheetah’s night vision is poor, certainly compared to her cousins in the big cat kingdom, so she’s the only big cat that hunts during the day. This poses some unique challenges for the cheetah, as she doesn’t have the cover of darkness to enable her to spring a surprise attack on her prey. She spends the mornings and early evenings looking for prey, when there is light but low sun. To hunt under the heat of a high sun would be extremely challenging for the cheetah, given the energy she needs to expend to catch her food. Cheetahs typically hunt zebra, wildebeest and gazelle. These are all herd animals and all take turns to look out for danger. So the stealthy cheetah assassin must use her wits as well as her lightning speed to give her the best chance of getting a kill. She’ll always approach her prey from a downwind position so her scent doesn’t give her away. She’ll use the natural undulations and peaks of her habitat, such as hills and termite mounds, to cover her as she approaches. She has to stay out of sight until it’s time to pounce. Once she’s spotted her prey, she stalks it. Tall grass is essential here. Fortunately for the cheetah, the places where her favored prey gather to drink are typically surrounded by tall grass. Using the tall grass for cover and her spots as camouflage, she silently approaches her prey, treading softly and slowly to avoid detection. Although the cheetah is the fastest land animal in the world, she’s not capable of prolonged chases, so she needs to position herself as close to her prey as possible before she decides to make an ambush. 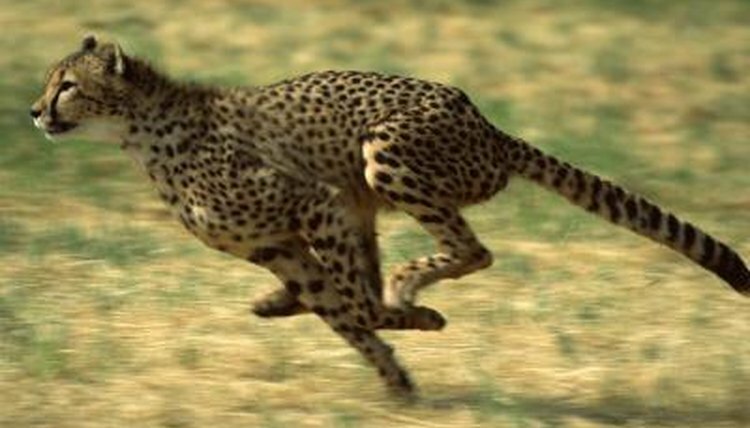 Once close enough, the cheetah uses her electrifying speed to launch a surprise ambush. Once she’s in sight, her prey will bolt, so she has to chase down any laggers before she is exhausted. If she times her hunt well, her raw speed means she’ll quickly catch something. Cheetahs can hit speeds of 71 mph and use their long tails for balance, so once the hunt is on, she has a 1 in 10 chance of getting a kill, according to Lions.org. Once she’s subdued her prey, she may begin eating it before it is dead. This is to reduce the chances of a scavenger, such as a hyena, or a larger big cat like a lion coming along and robbing her of the prize she worked so hard to win.